We are a joint venture of various suppliers of the event trade. 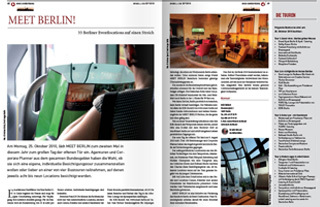 Since 2010, we have been jointly promoting ourselves and Berlin as an event destination. 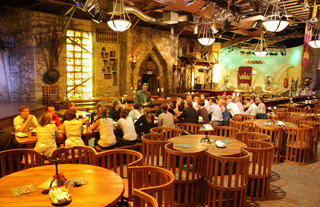 Our aim is to provide extensive information for event managers both in and outside of Germany. Event managers will find everything they need to organize and realize their events in our network. If desired our team can also support event organizers with the event management. Become a partner of our network! 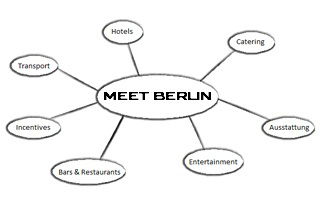 This does not just include an advertising entry at www.meet-berlin.net. You will also find additional advantages that help you advance in your business. Our partners get special deals not only at trade fairs but also with catalogue distributors and branch magazines. We do not receive state subsidies, but finance our marketing activities through the membership dues of our partners who are presented on this web portal. All marketing measures are built in modules. This means that every partner decides for himself in which activities he wants to participate. One shares the costs and reaches a much larger number of potential clients. Many of our partners now work closely together and recommend and book each other. At our partner meetings, which take place 3 - 4 times a year, information is exchanged and recommendations made as to which marketing measures to concentrate on in the future.